Classic Pro w/ Tour Case, Pedalboard / PedalCase from Pedaltrain in the Classic series. The flight case seems very sturdy and well-finished, and so does the aluminium pedalboard: that’s the main reason behind my choice. The hard case’s sides are made of plywood birch over 5mm-thick. The hardware seems reliable too. The price is far from low, hopefully it’ll last a lifetime – at least that’s what I hoped when I decided to spend that much, unlike my Rockcase which only lasted for approximately 3 years and had cost me €139. After these 3 years, my Rockcase was completely washed out, the aluminium rail under the handle was beginning to fail everytime while it was being carried due to the important weight (25kg more or less), leaving all the weight to rest on the sole wing nuts – which ended up failing too after I’d changed the rail. 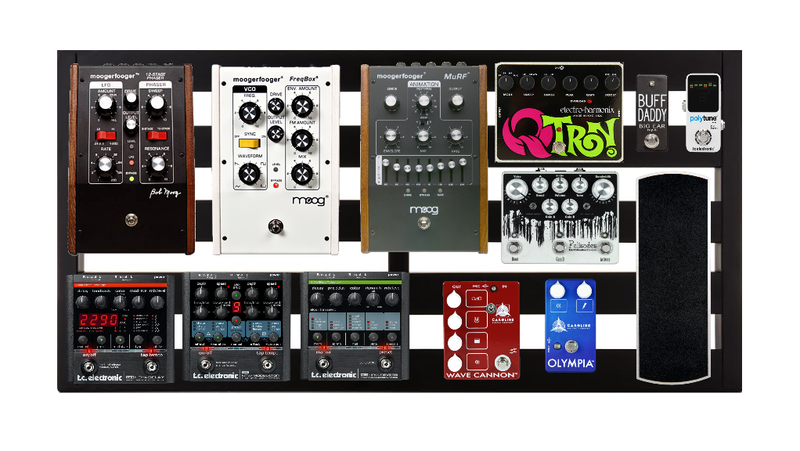 The Pedaltrain would “only” have to last 2.5 times as long to be a profitable purchase. I’ve fille dit with a TC Electronic G-System, 2 Boss FV500L expression pedals, 3 standard-sized MXR and Jam Pedals stompboxes, an ISP Decimator and a Boss AC3 as well as a Voodoo Lab pedal power 2+ supply and an RJM Miniamp Gizmo MIDI box. Cramming it all within the 80x40cm space was like playing Tetris (my previous pedalboard was 80x50), but I managed to do it thanks to the supply and MIDI RJM that fill under the pedalboard. I didn’t want to buy the upper model ,the Pedaltrain Terra 42 which is over 1m wide and costs an extra €120. The Classic Pro is a bit lighter than the old PT-pro-HC which it has replaced in the brand’s catalogue (the flightcase is 35% lighter according to Pedaltrain’s website). It’s more or less the same board, but the flight case features no wheels on the side or the small additional compartment. So, it can only contain the board, but it’s also lighter and less cumbersome than the old version. It’s not a lightweight though, as the 1.47kg advertised by the online seller I got it from (against 2.72kg on Pedaltrain’s website) don’t include the hard case. This weight (while diminished compared with the previous version) translate the absence of compromise in terms of sturdiness and reliability. Effect pedals can be velcroed, screwed or cable-tied – a wide array. In case you want to use screws, you’ll have to drill a small hole in the aluminium structure, so you could end up with a pedalboard full of holes if you often change your pedals – which makes the Velcro and cable tie options all the more preferable. 2 velcro rolls (1 hook and 1 loops) and a dozen cable ties are included. The Velcro works very well, just pay attention to the fact that the surface has to be clean and dry for it to adhere. 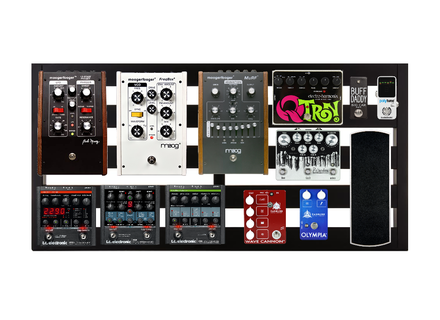 Pedaltrain’s typical “spaced-rail” design board is very practical to make the various (jack and supply) cables go under the board and to keep things tidy between the pedals themselves. A bit of organization and time spent, and all is clean. It also makes setup changes less easy as you’ll have to cut the cable ties and put new ones for any change in your pedals. The board is held within the hardcase thanks to the thick foam which is stuck to the lid. I had to cut in it because of my G-System which was a bit too big for the hard case (and for the soft case too): this way, it just comes in. There are many videos, tutorials and so on on the web on how to set your Pedaltrain up, don’t hesitate to have a look, some are very instructive. To screw things into the board, all you’ll need is a drilling machine, a metal drill slightly (but not too much) smaller than the screw thread and as shown on videos you only drill into the beginning of the board, screw in and it works – no need for dowels or nuts. In the end, this is a very high quality pedalboard which is quite pricey – but quality induces a cost. I’ve only had it for a short period of time, so no long-term opinion yet as to its sturdiness. I’ll give it a 5-star rating for the flawless finish and quality, and that rating is to stand provided it lasts long enough.